We are at a decisive pivot point and its far more consequential than the mid-term elections. Even then, we cannot but marvel at the utter complacency which still prevails in the casino. We even heard one bubblevision talking head today suggesting that on the off-chance that the GOP retains the US House of Representatives (the Senate is virtually guaranteed to stay Republican), it will be mighty bullish for stocks. That's because it would mean more fiscal stimulus, presumably another tax cut of the 10%/$200 billion cost variety that the Donald has been plugging out on the hustings. We actually don't know which is more pathetic. A putative GOP controlled government that would actually even consider adding another $200 billion on top of the $1.2 trillion Uncle Sam is already slated to borrow in the 10th year of a flagging business cycle expansion--and in the face of the Fed's unprecedented $600 billion bond dumping campaign---or Wall Street operators who apparently do really think that Federal borrowing is what generates economic growth and business profits. In any event, the boys and girls in the momo trade are about to find themselves up close and personal with the great central bank Pivot soon enough. Even Kuroda-son chimed in the other day from the red hot printing presses at the Bank of Japan suggesting that the time for "extraordinary" monetary accommodation has now passed. So the hand-writing is on the casino's lethargically blinking green screens. The 30-year monetary party is over, and the money printers which fueled that global bond bubble of the present era are about to become the bond-dumpers of tomorrow. Adding to bond supply for sale rather than to demand for bonds to sequester on their balance sheets, central banks will force meaningful yields back into the bond trading pits as the latter perform their job of discovering the yield which clears the market, which most certainly will not be today 3.23% yield on the 10-year UST. In fact, what is fixing to happen is that bond market speculators are fixing to jump the shark. 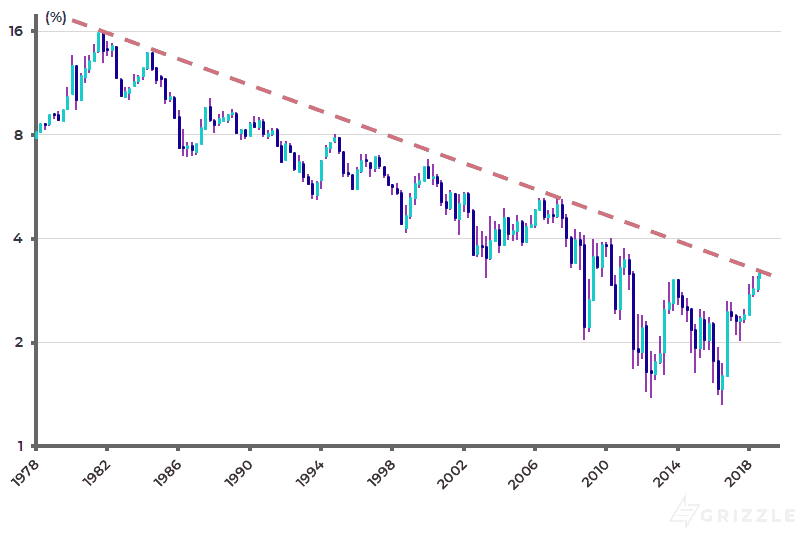 That is, the 35- year down-ward trend line, which has been in place since your editor was feverishly contemplating the desultory math of $200 billion Reagan deficits as far as the eye could see in the face of 16% UST yields. Volcker took care of that problem, of course, by plunging the US economy into a nasty recession and wringing-out the 8% or so inflation expectation that was embedded in the bond yield shown at the upper left hand side of the chart below. Thereafter, of course, incepted the longest-running bull trade in recorded history. And yet on election eve, the bond pits closed down just 3bps from puncturing the trend line from below; and in the face of an election that is far, far more certain than the chattering commentators even hinted at all day. To wit, it is absolutely guaranteed that during the next two years there will be a non-functioning government and that Washington's abject fiscal incontinence will reach the point of downright embarrassment---even down there in the Imperial City. So now the real price discovery begins down in the bond pits no longer being relieved by the central bank monetary sump-pumps. And one of the things this belated return to quasi-honest price discovery in the fixed income market will expose---in the manner of Warren Buffett's metaphor about the exposure of naked swimmers when the tide goes out----is the risible "savings glut" humbug promulgated by Ben Bernanke and other central bankers. The latter never remotely happened. The "glut" actually consisted of the $21 trillion central bank balance sheets expansion; it was the functional equivalent of "savings" in terms of its impact on the bond market supply/demand equation and therefore interest rates and the level and shape of the yield curve. It's as if arsonists were running around a burning building with a can of kerosene screaming that there is a fuel glut. But now for reasons of institutional survival, as we develop below, they have jettisoned the kerosene and manned the water hoses. Needless to say, you don't remove $21 trillion of supply from the global bond markets without leaving big-time dislocations and distortions in this massively hollowed out financial space---even beyond the evident and purposeful falsification of interest rates which ensued. One monumental consequence, of course, was the massive global hunt for yield and risk-asset based returns in the equity markets. 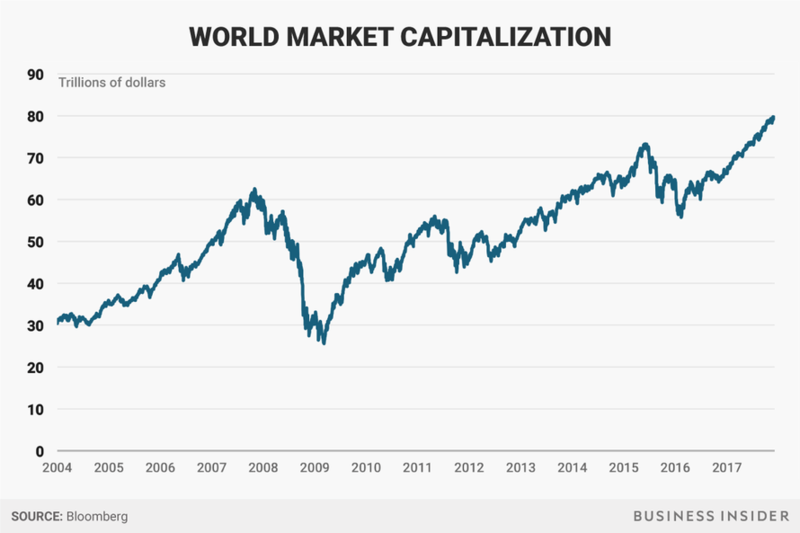 During the same 15-year period in which central bank balance sheets soared by $21 trillion, the market cap of the world's bourses erupted by $50 trillion. To be sure, some part of that gain was owing to genuine economic and profits growth, but a substantial portion was actually attributable to multiple expansion. That is to say, as the central banks systematically drove bond yields and cap rates lower with their big fat $21 trillion thumb on the scale, the reciprocal effect was to inflate PE multiples and other asset valuation yardsticks. Our point here is not to begrudge the punters and gamblers who rode this $50 trillion equity market tsunami to fabulous riches: It wasn't real, and the next stop on the bubble express is something like the 2007-2009 meltdown shown in the graph above when the global equity market cap plunged by nearly 60% from $60 trillion to $25 trillion. The equivalent plunge this time would amount to $50 trillion, but a reprise of the V-shaped rebound which occurred after 2009 is now out of the question because the central banks have already shot their wad. The various forms and phases of QT----which were essentially a $21 trillion monetary fraud---- were the work of a one-trick pony. In fact, the reason the central banks are suddenly pivoting to QT under the leadership of the Fed is to hastily replenish their dry powder. But it's too late. They will destroy the equity bubble long before they get back to "normal" interest rates and balance sheets---even as they fear that after the next crash they will be impotent to reverse the carnage and that the pony will then be taken out back and shot. Nevertheless, one of the skeletons lurking inside the world's $80 trillion stock bubble is the economic corollary of delirious windfall gains on existing financial assets. To wit, on the margin wealth gains from financial asset inflation have supplanted real money savings from current income. If the aim of investors is a certain stock of wealth relative to current and prospective income, upwards of three decades of financial asset inflation have steadily dulled the incentive and need to save and forego current consumption. For instance, even though by 2004, global equity markets had been inflating at a far more rapid pace than income growth for upwards of two decades, the $30 trillion of stock market capitalization at the time represented about 68% of global GDP, which was about $44 trillion. By contrast, the $80 trillion global equity capitalization at the peak of a few months ago represented about 100% of current year worldwide GDP. So even though worldwide income back in 2004 was undoubtedly over-capitalized in the equity markets, it has now become egregiously so after the post-2008 print-a-thons. Consequently, even if you give the benefit of the doubt to the implicit 2004 cap rate of 68%, global stock markets today would be worth about $55 trillion. You can characterize the $25 trillion excess at the recent bubble top, therefore, as the windfall to savers and investors owing to central bank financial repression. To be sure, we doubt whether anything in the real world is clinically mechanical and quantitative to the nearest trillion. But we are quite confident that the fantastic central bank bond buying spree and resulting massive equity bubbles of the last several decades has driven the real money savings rate to rock bottom levels. What this means is that the real money savings pool is inordinately shallow and that, therefore, Buffett's proverbial swimmers---governments, households and companies---which have been borrowing hand-over-fist owing to the negligible cost of carry, are going to be in for the mother of all shocks when they have to refinance their giant debt loads at steadily higher yields. Indeed, there can be no doubt about the shallowness of the US pool of household savings and it is merely symptomatic of worldwide conditions. For instance, the legendary Japanese savers, who hived away upwards of 20% of income four decades ago, are currently saving at low single digit rates. 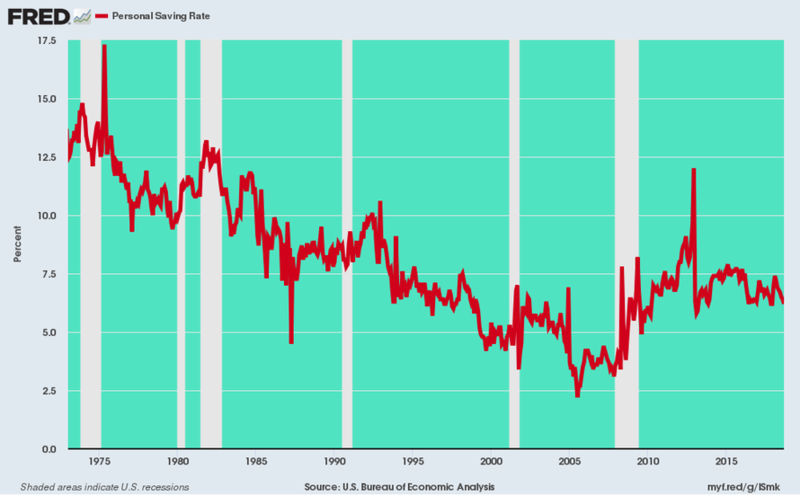 Likewise, based on the Commerce Department current method of counting, the US household savings rate historically ranged in the 10-15% range (it's a residual derivative after all spending has been subtracted from current income). But the savings rate then dropped into the 8-10% zone during the Reagan era, and has continued to trend lower since, tagging just 6.4% in Q3 2018. That's thin gruel when the central banks are no longer sucking up trillions of bond supply annually. So as we see it, the 10-year US Treasury yield will break through 4.0% before the end of FY 2019 and continue to climb steadily higher from there---with 5.0% easily reachable during the years just ahead. Indeed, it is hard to see any other outcome when the household savings rate in the US is still in the sub-basement of history and when the central banks are on the sidelines; and when, also, the inexorably rising dollar FX rate (due to escalating US yields) will make currency hedging prohibitively expensive for private foreign investors. On of the insidious Wall Street lies of the present Bubble Finance era is that stocks are to be bought because interest rates are low. The unstated part of that proposition, however, is that they have been ordained by the financial gods to stay low forever, world without end. But that was a Big Lie. And it's exactly why the main street economy is in big trouble----trouble that has been made immeasurably worse by the lunatic Trumpite/GOP fiscal debauch. The truth is, US household and business borrowers have been implicitly embracing the permanent low interest proposition, too. So doing, they have steadily and systematically driven the US economy's aggregate leverage ratio to unprecedented heights. This amounts to a rolling national LBO which has been building since the early 1980s, and which now constitutes a dodgy financial edifice that is not remotely built to withstand the shock of even quasi-normal interest rates.